Leading the nascent Nigerian space program is one really tough gig. There is no billion dollar budget. The labs and equipment are far from cutting edge. The agency's museum sits empty. New challenges lurk around every corner. Yet S. O. Mohammed, director general of the Nigerian National Space Research and Development Agency (NASRDA), is determined to wring scientific achievements out of his shoestring budget. "We have always said ... the Nigerian space program is not going to be an ego trip," Mohammed told CNNMoney. "We are not part of the race for the moon, we're not part the race for Mars," he continued. "What we need to look at is using the space program to look at how we can create typical Nigerian solutions to most of our problems." Mohammed's goals include the ability to locally design and build a satellite by 2018. By 2030, he hopes to launch a satellite from Nigerian territory. After that? He wants to put a man to the moon. Yet Mohammed faces intense scrutiny. Critics want to know why Nigeria is spending money on a space program when 70% of its citizens live below the poverty line. When the country's economy is facing an imminent recession? Moreover, what's the point of a moon mission that would launch more than 60 years after Apollo 11? Mohammed points to the country's three existing satellites as evidence of what can be gained from a national space program. Already, they've helped document regional climate change patterns and update the country's outdated maps. 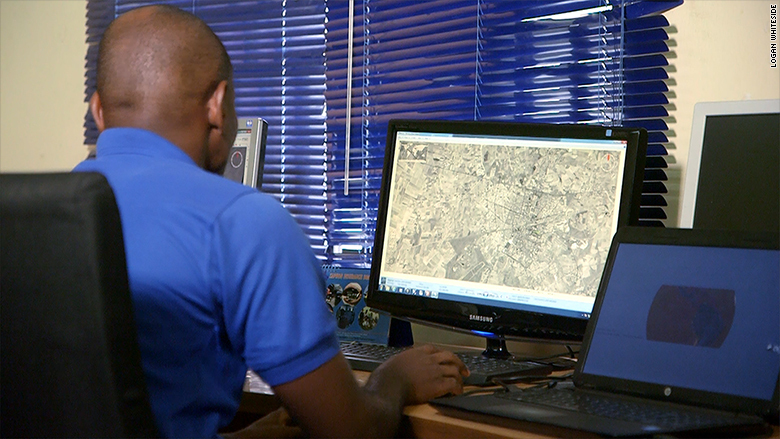 They've also been useful in tracking the movements of terrorist group Boko Haram in remote areas of the country. Mohammed's next priority is launching a Synthetic Aperture Radar (SAR) satellite capable of penetrating cloud coverage. The images it produces should help monitor activity in the Gulf of Guinea, which has recently seen a rise in pirate activity. Mohammed says these projects are about "capacity building" -- advancements that will eventually turn Nigeria into a regional space innovation hub. Look no further, he says, than NASRDA's 2,000-member staff. Mohammed recalls that when he started at the agency eight years ago, it boasted just six scientists with PhDs. Now, the number of PhDs on staff has increased to 70, and another 50 employees are studying in pursuit of advanced degrees. Mohammed says the money will be put to good use -- after all, Nigeria is building on the efforts of others. "We're not reinventing the wheel," he said. "The Nigerian model is a good model for the developing world. We're not starting all over like the U.S. or Russia."